A historic brand in automotive. A historic signature in design. Put the two together and you get an explosive new concept car called the Jaguar B99. The name B99 stands for B as in Bertone and 99 for the company near 100 year anniversary in 2012, one of the oldest design companies in the world. The concept projects Jaguar’s classic style into the future with refined Bertone elegance, exploring a fascinating new form language with a “dynamic imbalance” between parallel lines and leaping forms. The result is a compact, four-door sedan (4.5 m long, 1.35 m tall, 1.95 m wide, 2.8 m wheelbase) that fits perfectly into the D segment. Starting with a classic three-volume architecture, Bertone designers have shaped the taut, muscular body with bold yet refined character, entirely constructed with handmade aluminum panels in true Italian “coachbuilder” tradition. The unique personality of the luxury sports sedan is emphasized by the sophisticated minimalism outside and in, underlining the true nature of the British authenticity where understatement equals exclusiveness. In terms of technological innovation, the B99 uses a pure hybrid power system designed and developed by Bertone Energy (the newest Bertone division dedicated to renewable energy research), including a thermal engine for range extension and two electric motors which provide propulsion for the rear wheels. Bertone has been studying ecologically sustainable powertrain systems for the past twenty years, with many examples including full-electric “extreme” concept cars like the 1992 Blitz or 1994 Zer record car, which was the first full-electric car to break the 300 km/h speed barrier in the world. 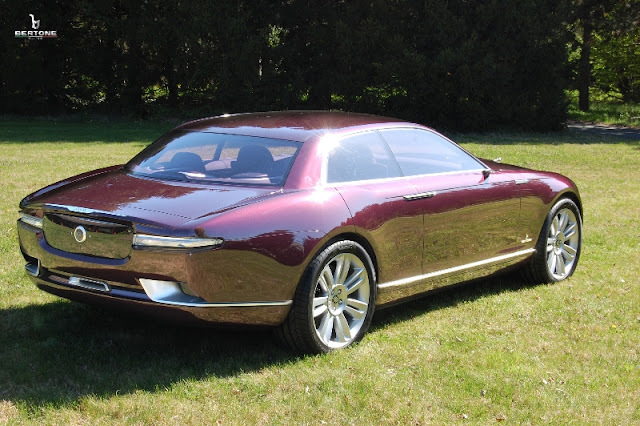 With the 2011 Jaguar B99 concept car, Bertone establishes a new record in its 99 year history as the only Italian designer to have created five different Jaguars. 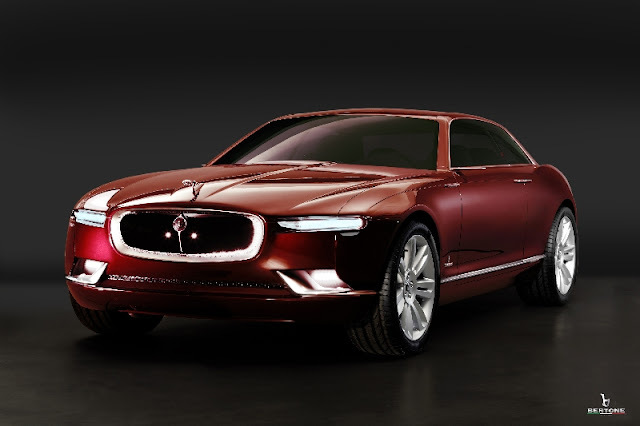 The previous models are the 1957 XK 150, produced in a limited edition of four copies, the 1966 Jaguar FT concept car, the 1967 Jaguar Pirana, and 1977Jaguar Ascot. Start from the brand. 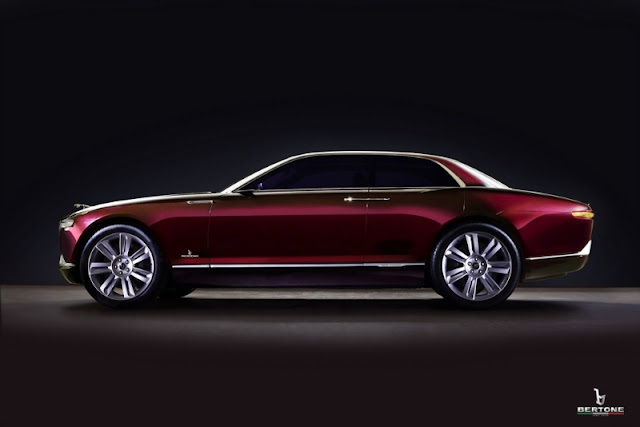 This is the concept that Mike Robinson, Bertone Brand & Design Director, gives his design team for every project. As an outside design source Bertone must do a lot of catching up on what in-house designers take for granted: a deep knowledge of what their brand was, is, and will be. So Robinsons’ team began in late October 2010 with a pre-sketch research program called: “From Cats to Cars”, exploring all the possible analogies coming from this spectacular feline from Central and South America. In fact ancient Aztecs and Mayans worshipped this noble predator for its cunning tactics and sheer power, calling it “yaguar”, meaning “he who kills with one leap”. These big cats can reach 160kgs and are very stocky with powerful but short legs designed specifically for a silent, “stalk and ambush” approach to hunting, sneaking slowly through the bushes low to the ground until their powerful pounce concludes the hunt. This stealth or silent approach to hunting is very different from other large feline species who run down their prey with long agile legs like the Cheetah. The Jaguar has an oversized head with an exceptionally powerful jaw capable of crushing skulls. Today the modern symbol of the Jaguar automobile manufacturer brand is the infamous “leaper”, a chrome image which poises the elegant animal in a powerful jump forward with all the weight centered on the rear hips projecting the enormous cat forward with lightning fast speed. The big head is stretched out ready to grab the un-expecting prey. This icon has conditioned Jaguar car design for decades and continues to weigh strongly on the overall balance and proportions of Jaguar automobiles past, present, and future. Unlike other high performance sports cars, Jaguars are designed for “wofting” or floating down the boulevard in silent grace. The first thing that strikes the observer about the B99 concept car is not a high tail – low nose wedge shape like most modern sport sedans. In fact the traditional three volume architecture has headlights and taillights that are roughly the same height from the ground. The beltline and the rocker panel are perfectly parallel. Still, the cars’ form language is all but horizontal. The muscles on the B99 are tight, like a sprinter seconds before the gun shot, or a jaguar ready to pounce. In fact the bodyside seems like it is leaping forward. This contrast between “linear and leaping” is the secret of “dynamic imbalance”, the evolutionary trend which suggests a possible Jaguar design language of the future. The front end starts with the forward leaning Jaguar grille which now looks down on the road showing the “British confidence” Jaguars have always had. The angle of the grill is likened to a slingshot, which naturally tends to angle forward in order to counterbalance the tension of the powerful payload about to be launched. 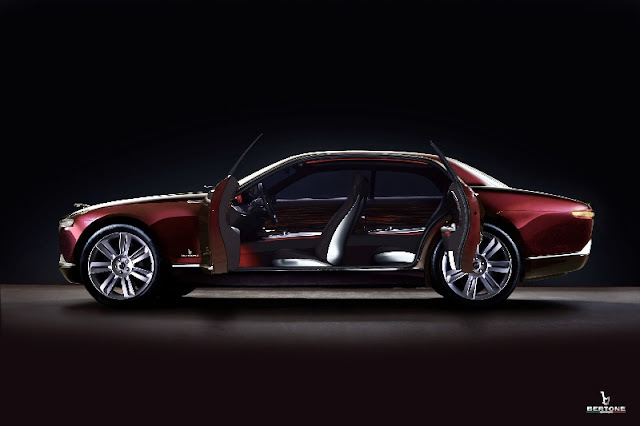 This tension visually extends the hood, and when combined with the high position of the headlights, gives the B99 front end a superior stance from any angle, hinting at classic Jaguar grilles from the past without renouncing the modernity and the glamour of its futuristic luxury, conveying a feeling of motion and agility. Above the grille we have replaced the classic leaping jaguar . Thanks to advanced technology, motion sensors anticipate the vicinity of any object (or person) that comes close and electric motors will pull it down under the level of the hood in a fraction of a second (think airbag deployment speed) before any damage can be done to the pedestrian. The body side of the car is characterized by an extremely long wheelbase (2.8m) with a classic short front overhang and a long rear one. The traditional three volume greenhouse has been shortened (about 75% of the wheelbase). and lowered, now seems to be sunken down into the body, like a Jaguar stalking its prey, offering an extremely modern glass-to-mass relationship. Another demonstration of “dynamic imbalance” which transmits both mystery and glamour. The B99 has the visual center of gravity placed “on” the rear wheel, where the C pillar meets the body and where the powerful hip muscle launches the car forward towards the front grille. Rear view mirrors are futuristic, ultra-thin chrome wings with tiny video cameras that protrude out from the beltline trim molding. The extra wide stance seen from the rear end is especially important in a car with so much plan view taper. The powerful hips are poised and ready to pounce, demonstrating the silent power the car exudes. The rear grille is very similar to the front grille, with the same floating gloss black insert which carries the round Jaguar logo, but without the chrome frame. The same high, horizontal taillights float out sideways from the rear grille, again accentuating the exceptional width of the vehicle. The wide center exhaust pipe is a reminder that the hybrid vehicle has a thermal engine for extended range capable of bringing the best of both worlds, low pollution with hair-raising performance. The active aerodynamics in the B99 is visible in the rear spoiler which automatically rises at high speeds for extra downforce and reduced air turbulence. 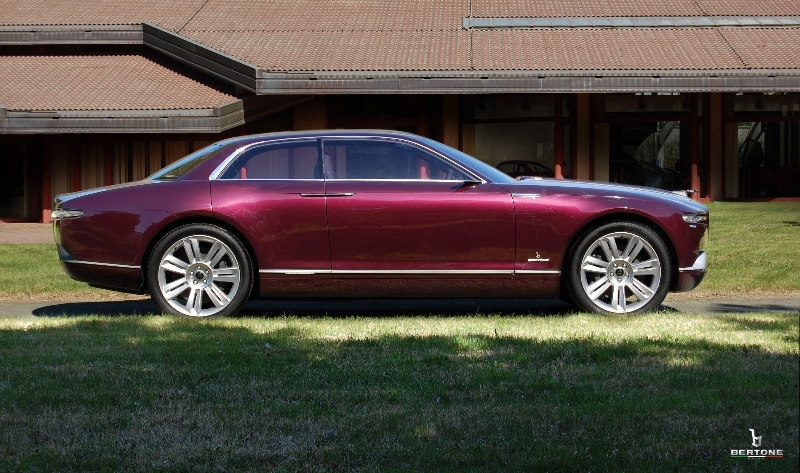 At lower speeds it simply disappears back into the trunklid. all who desire to enter. The deep, dark brown interior is rich in two-tone leather, one with an extra opaque, big grain finish and the other with a pearl, semi-gloss, small grain finish. This dark, luxurious ambient is offset with bright accents in both brushed aluminum and high gloss wood which generate a hidden richness throughout the interior. 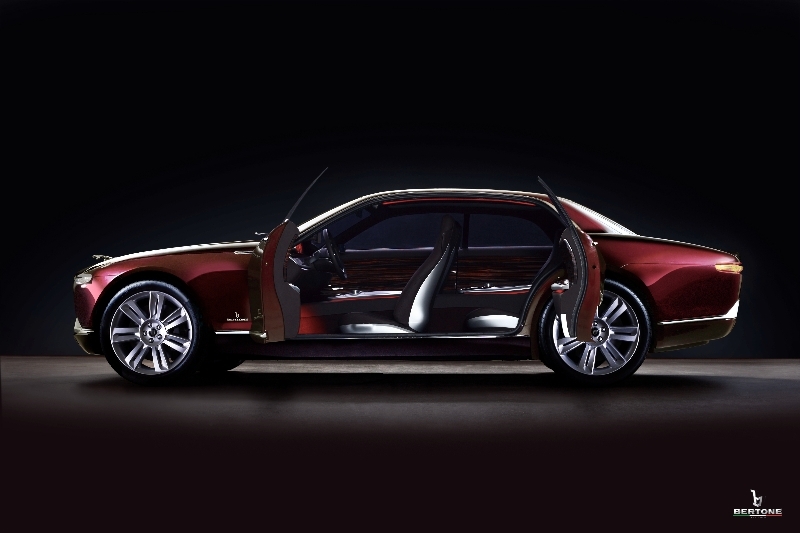 Jaguars are typically very individualistic sports cars which privilege driver needs with a dynamic living space. While other luxury sedans are rear passenger oriented Jaguars are definitely driver oriented, with a “you can come too” attitude for passengers. This hand crafted cockpit has a “built up” look using prestigious materials wherever you look, touch or smell, taking perceived quality to higher levels. The relaxing yet responsive environment transforms beautiful forms into high performance controls before your very eyes at a single touch. “Surprise and Delight” are part of the Jaguar DNA. Once seated the first component that strikes the eye is the wide, horizontal instrument panel which has an elegant, wrap-over, concert piano feeling, with lacquered Ebony Macasar African wood completely framed in a discreet brushed aluminum frame which carries the Jaguar signature in the center. The built-up look adds layers of components to formulate an overall living space which is an extension of both the wealthy home and the business office. The lack of visual noise is a modern way of redefining luxury, putting pure, refined form and materials above all the flashy high-tech buttons that fill most luxury car interiors today. According to our “Cats-to-Cars” research, the very nature of the powerful Jaguar cat is based on its silent approach to hunting, where “less is more”, total silence avoids any form of advanced warning until the lightning fast leap attack. So true modern exclusiveness in a Jaguar comes from the lack of visual noise. As mentioned above, another classic characteristic of modern Jaguars is the “surprise and delight” feature which hides almost everything only to reveal the functions at finger-tip touch. This aspect allows the driver the pleasure of demonstrating to both friends and business colleagues Jaguars’ “hidden riches” and purity of idea. 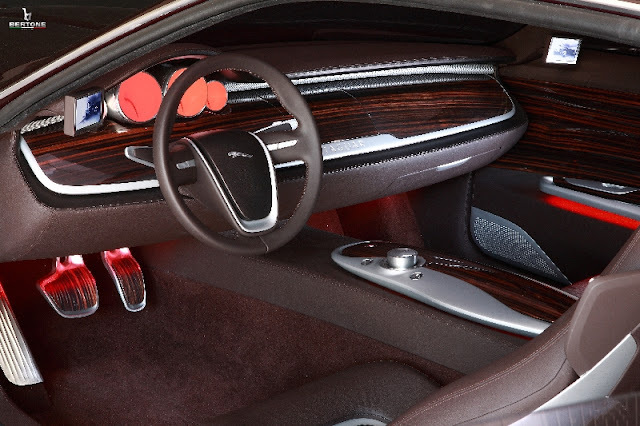 The large central infotainment screen is hidden behind the continuous wood panel which stretches across the entire instrument panel so as to maintain the purity of form and materials when not in use. The same is true for the ultra-slim horizontal air registers which are hidden deep in the shadows between the floating “wing” and the main body of the fascia, covering the entire area from A pillar to A pillar, virtually unnoticed. The instruments are all found in four, classic aluminum cylinders which also float between the “wing” and the fascia. Each cylinder is filled with a ceramic white trumpet shaped analog dial with hidden numbers, transforming traditional 2D dials into innovative tridimensional, backlit sculptures which magically come to life when the start button is pushed. The gear shift lever is a similar mechanism which has the same cylindrical trumpet shape in ceramic white that comes up out of the center console at a touch of the finger. Externally the mechanism serves as an automatic transmission gear shifter but internally serves a mouse command for the hidden infotainment system. When touched, the floating front arm rest on the center console moves forward and upward into an inclined plane, creating a visual bridge between the wide longitudinal tunnel and the wide horizontal fascia. The door panels are designed with an innovative, wood insert with an elegant sculptural motif based on the “ripples on a lake”. The floating arm rests found on all four door panels are the same as those found on the center console. Each arm rest has window lift switches and the drivers door has a multi-function iDrive mechanism which disappears when not in use. Rear passengers can take advantage of the floating arm rest which continues up and over the top of the rear center console. This beautifully detailed piece of modern furniture not only acts as a multi-purpose arm rest but also slides out to hold two Champaign bottles in a refrigerated compartment. “Performance through innovation” is one of Jaguars slogans, and today more than ever powerful sports cars must find new responsible ways to offer both high performance and ecological sustainability. The B99 is powered by a modular, Extended Range Hybrid system which futuristic utilizes twin 150kW (204 Cv) electric engines connected to the inboard side of the rear axle for propulsion and a lightweight 1.400 cm3 thermal engine producing 125 kW-170 Cv for range extension, giving a combined power output of 425 kW or 570 Cv. The thermal engine charges the Lithium-ion batteries while driving allowing for a theoretical range of 700 kilometers of highway driving between fill-ups with a carbon dioxide output of around 30 g Co2/km. The B99 can also travel in full electric mode offering zero emissions for 100kms. Jaguar XK 150 – 1957: produced in a mini-series of four automobiles, this coupé was based on the XK 150 and was inspired by subtle elegance. The bodyside was characterized by sculpted lines coming from the front fender, the greenhouse was shortened but was also very light and airy, almost a classic Bertone signature at the time. Jaguar FT – 1966: designed as a direct request from Jaguar, the FT was based on the S Type platform and was presented at the 1966 Geneva Auto Show. The four passenger, two door coupé was a very popular layout at the time and was interpreted with a low beltline, wide side glass and an original Jaguar grille with four headlights. Jaguar Pirana – 1967: based on the legendary E Type, the Jaguar Pirana was presented at the 1967 London Motor Show. The unmistakable proportions of the E Type led to what was considered a futuristic design at the time, with long hood, a short tail and muscled bodyside. Jaguar Ascot – 1977: based on the XJ-S platform with a V12 engine, the Jaguar Ascot was presented at the 1977 Geneva Auto Show. Typical 70s wedge shaped design with hard edges gave a sneak preview to the modern day 5 door coupés which became so popular some 30 years later. When we approached shape the different individuals for updating our auto subtle elements than the many individuals will give the numerous proposal and exhortation, however, these guides are not credible or helpful for our auto highlights. The stephen@carcare gives you the better and real exhortation in the wake of seeing your auto condition. His friends, Bertie Henly and Frank Hough who were motor trade entrepreneurs, at 91 Great Portland Street, London, sold them.